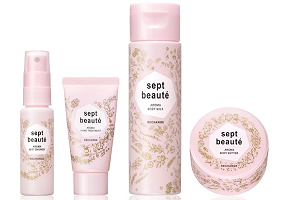 Japanese personal care giant Shiseido and Seven & I Holdings, one of the largest retail groups in Japan, are teaming up to launch a new skin-care brand called Sept Beaute. Aimed at women in their 30s and 40s, Sept Beaute is described as an “aroma body brand” and is designed to offer a pleasant scent based on Shiseido research into brain activity. It is described as being formulated with seven types of natural essential oil (lavender, orange, rosemary, sage, bay leaf, pelargonium and peppermint) that support a long lasting moisturizing effect. Each item in the new Sept Beaute line – Aroma Body Butter (70g), Aroma Body Milk (150ml), Aroma Hand Treatment (30g) and Aroma Mist Shower (a 30ml facial moisturiser) – is offered in scents: Recharge and Relax, the former a “re-energising” citrus base scent and the latter a “relaxing” herb based scent. The prices for the products are ¥1,500 ($14.75), ¥1,200 ($11.80), ¥900 ($8.85) and ¥900 ($8.85), respectively. Shiseido Sept Beaute will be available from the end of September 2016 via Seven Bino Garden, Seven & I Holdings in-house cosmetics counters, as well as the group’s online market place Omni7.